DeKalb Early College Academy (DECA) scholar represents students at December School Board meeting. 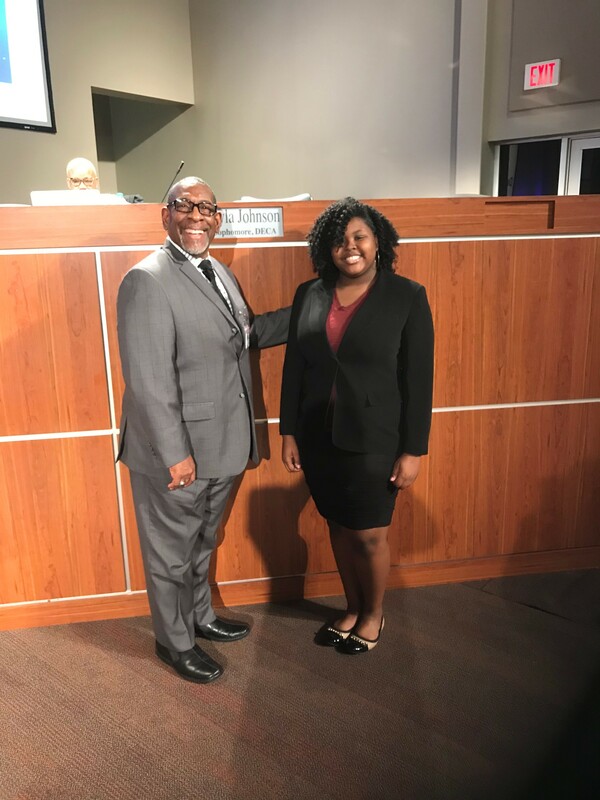 Nyla Johnson, a sophomore at DeKalb Early College Academy (DECA), represented the students of the DeKalb County School District at the December 4 meeting of the DeKalb County Board of Education. Nyla holds a 3.0 GPA and hopes to major in chemical engineering at Penn State, Louisiana State or Howard University. She is one of two students at DECA to be a part of the Superintendent R. Stephen Green’s Student Advisory Council. She is also active in her local 4-H club, as well as her school’s step team, Beautiful Ladies of Distinction. She is thrilled to represent the student body and hopes this experience will give her an inside look at the school system from the perspective of those in charge.